For many years, the shopping street of Wangfujing has been the pride of Beijing. Its glass facades are perhaps not that remarkable in today's Beijing, but the selection of products ranks among the city's most exclusive and it is said that Wangfujing is Beijing's only pedestrian street. 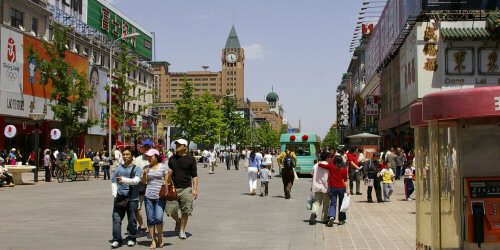 There are three large markets on this street: Sun Dong An Plaza, Beijing Department Store and The Malls at Oriental Plaza. They all sell mostly designer's clothes but you will also find jewellery, make up, wines and spirits, tea shops, cafÃ©s and a whole bunch of Chinese and Western fast food restaurants. The Malls at Oriental Plaza is known as one of the largest markets in Asia. Anything else you might want to buy is available on the rest of the street. There are two book stores. The larger one is called Wangfujing Bookstore and has some western literature on the third floor. The slightly smaller one, but with a wider selection of western books, is called Foreign Languages Bookstore. Toys and other children's stuff are available at Xin Zhong Guo Kid's Stuff/Children's Goods Store. A side street, west of Wangfujing, is called Wangfujing XiaoChiJie (Wangfujing Snack Street). Besides snacks, various sorts of souvenirs are available here. Finally, you should be aware that Wangfujing is not the place to make a bargain. The prices are higher than elsewhere in the city, but on the other hand the quality is, for the most part, good. The street should be looked upon more as a tourist attraction and shows its best side after sunset, in the neon light. Then the food market, Donghuamen Night Market, will be open too. There, you can taste octopus, scorpion and other mysterious food, but also safer stuff like dumplings, exotic fruits and fried banana. Some of the salespeople, but far from everyone, speak English. Most shops here have set prices, which usually makes bargaining useless, but there is no harm in trying.